Truth: I did not eat any good tortas in Mexico. Since then, I have been craving a great torta, so when I heard of a new spot on the Upper West Side that serves tortas during lunch, we all know I had to make the trip. Cocina Economica Mexico opened quite recently with a menu filled with Puebla-inspired home style meals. 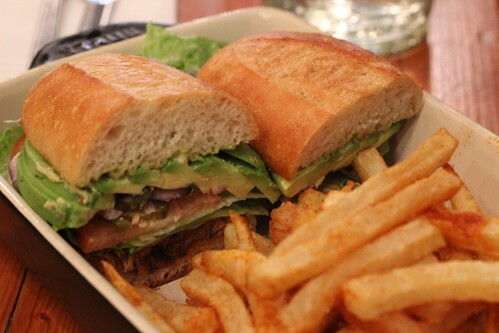 There's a bunch of dishes with stewed and braised meats and vegetables, but lunch is sandwich time in the form of tortas and cemitas. Since I can pull together the best breakfast sandwich ever, I went with lamb and added on avocado. You're getting the better half of an avocado added onto this sandwich which, to me, is quite awesome. I did wish though that there was a bit more lamb. I had been expecting slices of lamb, but instead it was almost a pulled style. Did it take away from the pillow soft bolillo roll? Yes. Was I appeased though with the spiced fries (which tasted similar to Old Bay fries)? Yes. I might not get the lamb again, but I will definitely stop by for a satisfying lunch or dinner when I'm in the neighborhood.